RALEIGH, N.C. – Since graduating from N.C. State University, Andy Albright dreamed of giving back to the university he loves dearly. On Tuesday, Albright and his wife, Jane made that dream come true. Albright, an N.C. State and Western Alamance graduate and the President and CEO of Burlington-based National Agents Alliance, helped officially open Innovation Hall, home of the Andy and Jane Albright Entrepreneurs Living and Learning Village and the Entrepreneurship Initiative, on Centennial Campus. The Albrights were joined by Chancellor Randy Woodson, Senior Vice Provost for Academic Outreach and Entrepreneurship Tom Miller, Vice Chancellor and Dean for Academic and Student Affairs Mike Mullen, Vice Provost for Campus Life Tim Luckadoo and Director of Albright Entrepreneurs Village Ebony Hinton as they cut the ribbon to officially open the doors of the Albright Village for faculty, distinguished guests and the first class of Albright Scholars, who will call the village home during the 2014-15 academic year at N.C. State. Woodson said having support from alumni like Albright were key in the village, allowing students to create new companies and innovative products. During the opening ceremony, Woodson remarked on the importance of entrepreneurship as an economic engine, noting that N.C. State’s Office of Technology Transfer has issued a total of 845 U.S. patents, launched more than 100 start-ups and created almost 4,000 jobs in North Carolina. He pointed out that many colleges and universities around the country have programs like the EI, but the facilities in place at Innovation Hall are a signal that N.C. State is raising the bar with the $500,000 gift from the Albrights. 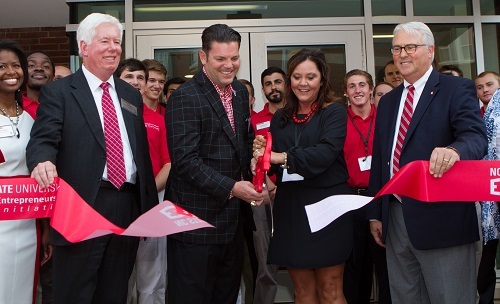 Tuesday’s grand opening of Innovation Hall marked the first opening of a Living and Learning Village on Centennial Campus and the first named residential community at N.C. State. Albright Entrepreneurs Village will provide students who have entrepreneurial interests with the opportunity to live, learn and collaborate with like-minded peers. Miller, who helped start the program in 2008, said the vision was to create a place where students could work and live together while feeding off their respective dreams and passions. Miller said the goal of the program was to create new products that can change the world for the better. After the opening ceremony, the Albrights toured the facility and had the chance to interact with more than 40 students currently in the EI program. Students showed off their new living space, presented their latest ventures and products – including a device to aid smoking cessation and a point-of-sale platform that makes donating to local schools and charities easy. The EI garage is a business creation and prototyping space that has all of the resources students need to turn their ideas into successful start-ups. Albright Scholars range from freshman to graduate students and they have access to work on their ventures 24 hours a day at Innovation Hall one floor below where they live. Albright said providing students at his alma mater an environment where they can catch the entrepreneurial spirit was important and could lead students to come together and think of something great. Benny Suggs, the alumni association executive director at N.C. State, said Albright epitomizes the Wolfpack spirit because he cares about his family, his community and his employees at NAA. He said major contributions from people like Albright make a huge difference in the opportunities the university is able to provide for bright, young minds at N.C. State. National Agents Alliance is an innovative lead generation and marketing organization that sells life insurance, annuities, and other financial services and products through more than 7,000 active independent sales representatives in 50 states. Focused on serving middle-income families, National Agents Alliance is the No. 1 United States provider of mortgage protection insurance and offers a broad array of other affordable products from highly regarded companies such as Mutual of Omaha, Transamerica Premier Life, Baltimore Life, Foresters, etc. Since its inception in 2002, National Agents Alliance has helped more than 1,000,000 families successfully apply for more than $100 billion in life insurance coverage. The Entrepreneurship Initiative (EI) at NC State distinguishes itself by encouraging multi-disciplinary participation on every level – faculty, staff, industry and outreach partners, and most importantly, students. With Dr. Tom Miller as its first executive director, the initiative was formed in July 2008 in response to the Chancellor’s call to “develop an educated an entrepreneurial work force.” NC State has long been widely recognized as a strong presence in the entrepreneurial community of the region. By organizing and energizing its efforts through the Initiative, NC State will provide a comprehensive springboard for ideas, projects, and partnerships. By leveraging its core strengths in science, engineering and technology, NC State will develop entrepreneurial solutions to society’s current problems and future needs. Through the Initiative, individual entrepreneurial projects and programs throughout the university unite to provide students with top-tier resources and opportunities. To learn more about the EI and the Albright Village, visit www.ei.ncsu.edu.